Depriving terminally ill and cancer patients, on the verge of losing their lives, of medical treatment is considered a crime against humanity. Such horrific crimes are completely politically motivated and carried out by Iraqi security forces loyal to the Iranian regime at a camp adjacent to Baghdad airport and ironically named ‘Liberty‘, all under the very eyes of the UN. Another patient suffering from heart illness says, Iraqi forces cancelled my medical appointment for various reasons while I don’t know if there will be another turn for me. Around 3,000 Iranian dissidents, who have during the past 28 years lived as refugees in Iraq, are now the targets of this massive crime. This blockade has to this day taken the lives of 22 of these refugees, who lived in Camp Ashraf – located 90 kilometers north of Baghdad up to 2011 – and then transferred to Camp Liberty neighboring Baghdad airport under a mandatory relocation. 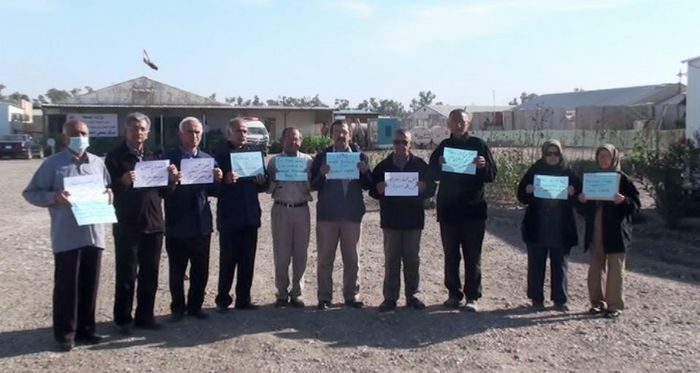 On Sunday, 9 November 2014, patients in Camp Liberty held a rally protesting this medical siege that has been ongoing for 5 years. One of the protesters in this rally, who could not stand on his two feet because his basic rights of enjoying access to medical services are being violated says, I came today so that maybe I could have my voice heard by UN representatives. However, as you see their vehicles did not even stop to listen to us. Inaction and silence by the UN and US, who are legally and morally responsible for our safety and security under numerous agreements and commitments, has actually facilitated the continuation and intensification of this crime by Iraqi forces against the refugees in these two camps. The patients in Liberty are now asking themselves does anyone know about their pains. Last week over 2,000 Iraqi physicians and medical personnel issued a statement condemning the medical siege and calling on the US government and UN to urgently intervene and take practical measures in this regard. Another lady participating in this rally says, I have been waiting for an appointment to undergo eye surgery for 18 months now. To this day, despite the fact that the resident Iraqi physician in the camp’s clinic emphasized that I need surgery, Iraqi forces have so far prevented me from going to a hospital on four different occasions, and I have missed my medical appointments. Currently I am losing my eyesight. She ends her words by asking, Who is responsible? 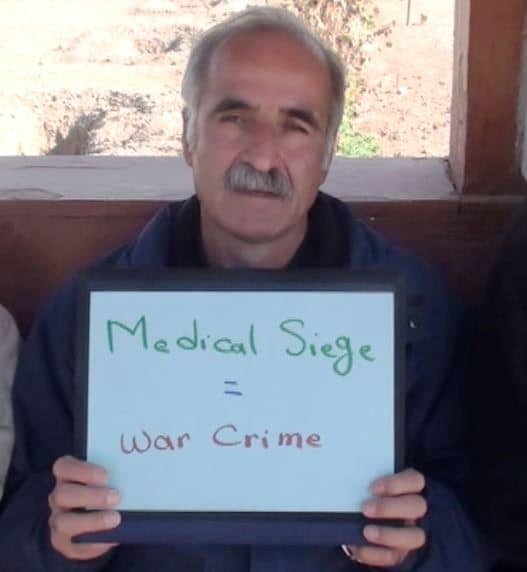 The harsh medical blockade imposed on Liberty residents, all considered ‘protected persons’ under the 4th Geneva Convention and ‘persons of concern’ by the UNHCR, are examples of a true crime against humanity in the making. At 8:30 am I reached the site of the protest gathering held by the patients near the camp’s entrance. The protesters, all patients deprived of open access to medical services due to the siege whose illnesses have all passed the point of no return, raised their placards protesting this blockade. The residents also called on UNAMI to lift these pressures and allow them to enjoy unhindered access to medical services. 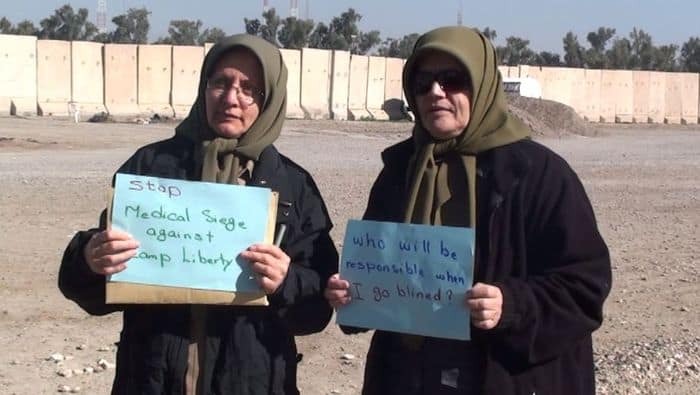 Isa is one of the residents injured in the 9 February 2013 missile attack against Camp Liberty when he lost one of his eyes to shrapnel. He says to this day Iraqi forces have cancelled his medical appointments six times. The day the medical specialist gave me an appointment the Iraqi forces simply said there will be no commuting today; go to the doctor another day! I said I have lost one of my eyes; at least let me go through the medical process I needs. My eye has become infected, for God’s sakes! I was talking to various patients when UNAMI vehicles entered the camp and while they saw the protesters who were calling on them with their signs and posters, and were asking for help to get medical care for their illnesses, they seemed to care less and passed on without stopping for a second.